Find out a quick trick to making a cup from school paper at school. The above origami diagrams will guide you through the process of making a paper cup....just follow the illustrations and instructions. Origami Cups : How to Fold Paper Cups with Easy Instructions - Learn how to make and fold origami cups. If you practice making a lot of cups, you will become very good at working with your hands, folding paper and following the illustrations. How to Make an Origami Cup - Cup origami model. Making an Origami Drinking Cup Instructions - Cup origami model. 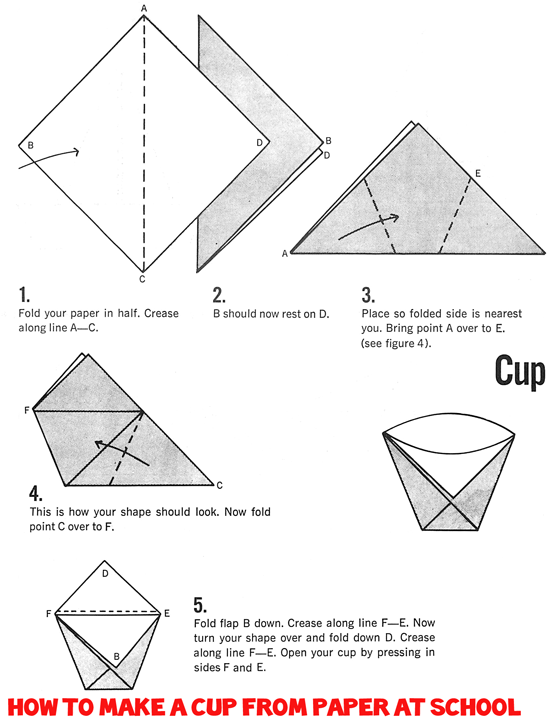 Origami Cups Instructions - Cup origami craft. How to Make a Paper Origami Drinking Cup - Origami drinking cup model. How to Make an Oirigami Popcorn Cup - Cup origami model.